South Shields will take a one-goal lead into the second leg of the Buildbase FA Vase semi-final after Andrew Stephenson’s 90th minute goal secured a 2-1 win at Coleshill Town. It was a tough afternoon for the Mariners in the Midlands, and they had to come from a goal behind at the break. David Foley levelled things up early in the second half before Stephenson turned in the winner to spark joyous celebrations among the huge travelling support. In truth, Shields had not been at their best for much of the encounter at Pack Meadow. Joint managers Lee Picton and Graham Fenton opted not to risk Gavin Cogdon or Carl Finnigan from the start, after both sustained injuries in the Durham Challenge Cup semi-final win at Consett 11 days earlier. Both did, though, make the bench. Shields made a decent opening to the game, and Foley sliced an early effort wide from distance as the visitors fired the first warning shot. However, Coleshill grew to have the better of the first half, with Liam Connell called into action on a number of occasions in the Mariners’ goal. His first job was to tip over a decent free-kick from home left-back Joshua Quaynor, while he also made a good stop from Robert Evans after a swivel and shot. The dangerous Jordan Nadat also went close early on as he received the ball with his back to goal and turned well, before his effort was well blocked by Dillon Morse. A further opportunity came Nadat’s way when a ball over the top saw him enter a foot race with Connell, and when the Shields goalkeeper got to it first, he blasted it against the striker and out for a goal kick. The Mariners were dangerous when they broke into attacking areas, and one decent chance came when a cross field ball was controlled by Foley, who took a touch before hitting a low effort which was blocked. Again, though, home goalkeeper Paul Hathaway was not called into serious action. Connell made arguably his best save of the match soon after when Nadat fired towards the top corner from distance, with the Shields stopper pulling off a superb one-handed stop to force it out for a corner. He was finally beaten in the 45th minute when Giovanni Dainty’s dangerous ball from the left was attacked by Nadat, and although Connell did brilliantly to beat it away, the striker was there to tuck in the rebound. Shields needed to produce a strong response after half-time, and they did just that, delivering arguably their best spell of the match in the first 10 minutes of the second half. Darren Lough was a constantly useful attacking outlet down the left, and after good work from Foley, the left-back had the first shot of the second period smothered by Hathaway. Lough was involved in the Mariners’ equaliser, which came in the 47th minute. After a corner was half-cleared, Lough took the ball down and played it into the feet of Stephenson on the inside-left of the box. He sent an effort arrowing towards the bottom right corner, and when Hathaway managed to parry it, Foley showed great composure to take it down on the chest and then force it over the line. Shields pushed on, and could have went in front when Craig Baxter’s cross from the right landed perfectly onto the head of Michael Richardson, but he nodded wide. Slowly, Coleshill began to get more of a foothold in the second half as the game again became even. The hosts almost retook the lead when Andre Gonzales’ right-wing cross looked to be heading into the top corner, only for Connell to claw it away from danger. There were chances at both ends, with Foley firing over on the turn for Shields before Connell pushed a low free-kick from Thomas Weale around the post. A golden opportunity fell to substitute Finnigan within nine minutes of his introduction as Robert Briggs played him in on goal, but Hathaway was quickly out to close the angle and did well to push it away. If that was close, Coleshill went even closer at the other end when Nadat hammered an effort against the post from 10 yards, and Richardson was on hand to clear off the line when it bounced back across goal. The game could have gone either way, with both teams desperate to take an advantage into the second leg at Mariners Park. Julio Arca was in excellent, determined form for Shields, and when he produced a stunning nutmeg deep inside his own half, he sent a superb ball over the top for Foley to run onto. Hathaway got there first, but his clearance fell the way of Richardson, who saw his effort from 35 yards trickle agonisingly wide as the goalkeeper desperately tried to get back on his line. Just as it appeared the tie may be level going into the second leg, the Mariners clicked into gear again. Substitutes Finnigan and Alex Nicholson linked up on the right to send Foley bursting into the box, and his ball across goal was diverted towards the net by Lough and then in by Stephenson, who in truth knew little about it. It may not have been pretty, but it was enough to get Shields’ noses in front. It was an advantage they held onto until the end, despite two scrambles inside the Mariners’ penalty area in stoppage time. At half-time in the tie, it is Shields who hold the one-goal lead, but it is still all to play for on Saturday at Mariners Park as the two teams again go head-to-head in the battle to reach Wembley. 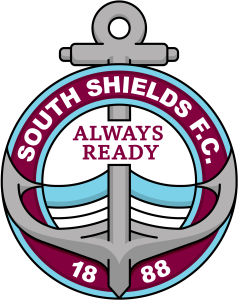 SOUTH SHIELDS: Connell, Baxter, Lough, Shaw, Morse, Arca (c), Briggs, Phillips (Finnigan 61), Stephenson (Smith 90+1), Richardson (Nicholson 85), Foley. Subs not used: Storey, Cogdon. Goals: Foley (47), Stephenson (90).